I was a kid with a lot on his mind. Conscientious yet earnest. Exams were second only to pre-season fitness training in the list of things I most dreaded in life. Well that’s the standard school experience, isn't it? Yes, but there’s more to it than that. I was conditioned to define myself by intellectual ability from an early age. My family would often tell me how clever I was, which only ramped up the pressure to perform while my boisterous classmates seemed to cruise through adolescence without a care. And these were good schools by the way. Private schools where academia was taken very seriously. I often look back and wonder what I would say to my 15-year-old self? “Chill out mate,” for starters. The assumption is that stress is bad for us. Our mood goes down, we feel increasingly irritable, we drink more, sleep less and age faster. Our world is one of increasingly burdensome demands and unrealistic expectations – at school, in the workplace, at home, online. Many of us simply can’t cope. The number of prescriptions for anti-depressants has doubled over the past decade (to 61 billion), while suicide – often linked to feelings of extreme stress – is the biggest killer of men under 49. No wonder meditation and mindfulness are big business. Robertson talked about an “arousal sweet spot” and trying to find that optimum activation point where we are challenged but not overwhelmed. He went into the science behind this state, clearly explaining that we are able to regulate the level of noradrenaline in our locus coeruleus by a simple act such as taking a few deep breaths. Or adopting a power pose and better posture to create a desired positive emotion (such as confidence) and improve blood flow to the front of the brain. We can also change the context of our brain’s arousal using words. He gave one delightful example of an experiment where two sides of a room were asked to calculate sums and perform songs in front of each other, preceding their test with one of two phrases – “I feel excited” and “I feel anxious”. The first group comfortably performed better. Robertson said the anxious group had a “threat mindset” while the excited grip adopted a “challenge mindset”. The symptoms of both states are quite similar – increased heart rate, dry mouth, sweating, churning stomach. The key is being able to use this heightened sense of sharpness to your advantage and to reframe potential threats as challenges. In turn, you begin to notice signs of good things to come and can more easily recall good memories in the moment. For example, anticipating the thrill of nailing that presentation and holding a crowd rather than dreading the embarrassment of fluffing your lines in front of everybody. Robertson goes into more detail on this fight or flight phenomenon here. A little stress can be good, therefore, but not the chronic kind as this stimulates the production of cortisol, which is quite corrosive in the body, moving a person into a state of fear and avoidance. Another factor that profoundly affects the biology in our bodies is adversity. According to Robertson, 30% of genetics is inherited. The remaining 70% is “to play for”. He described the brain as a “highly sophisticated piece of hardware, with 100 billion neurons and millions of connections [synapses].” Software can have a profound effect on the performance of that hardware, so experiencing or undertaking moderately stressful challenges is a way of writing/re-writing that software. Consequently, a person assumes greater control over their life and becomes more resilient in moments of adversity, thus being able to thrive in moments of stress. Compare a person that’s been cushioned and coddled as a child with someone that’s come from the school of moderately hard knocks and the former is far more likely to buckle than the latter. Apparently, it’s not good to tell kids how intelligent they are. Thanks mum. One of the ideas that really tickled the audience was “being your own drug dealer”. Robertson was referring to the fact that successful people regularly reappraise themselves and set moderate goals. These stimulate the left-brain approach system, which encourages us to seek rewards while triggering the release of anxiety-tackling, mood-boosting dopamine. Being skilled in goal setting can help you get the best out of a given situation, as long as it’s balanced with right-brain avoidance activity and noradrenaline release. How you find that balance and draw the line between moderate and extreme stress can only come with trial and error. I've been thinking about failure quite a lot recently. And not just my own, I might add. It's fascinating how attitudes to this potentially harrowing experience can differ from person to person. Some use fear of failure to drive themselves on while others block it out, liberated by their ruthless ability to charge forward from one uninhibited moment to the next in pursuit of success. You'll be hearing examples of both in the next Ideastap podcast, which I and the team having been working on for the past month or two. Choosing my biggest failure was a really difficult exercise. Not because there are so many; for me, there are no real rock-bottom stories or gasp-inducing anecdotes to share. It's more an ongoing, overarching sense that I haven't quite cracked life yet. Being present, at peace with myself, not sweating the small stuff, taking more risks… that sort of thing. Sure, I've tasted my fair share of rejection – by institutions, employers … girls. 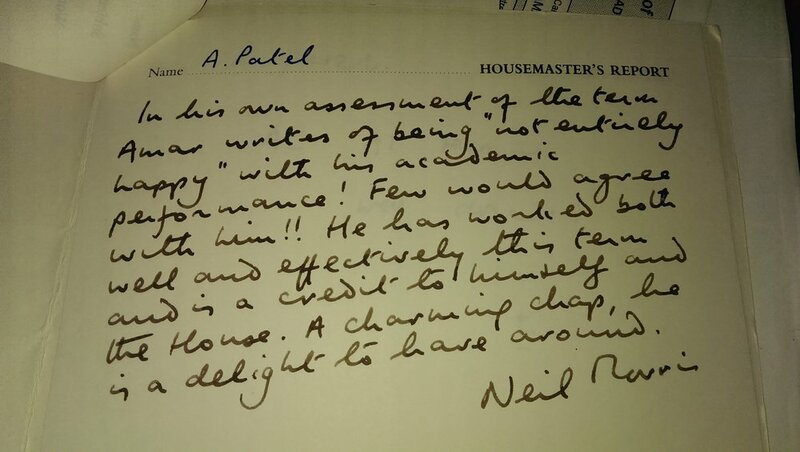 Then there was the time I was given a 'C' in AS level history, accompanied by a particularly cutting examiner's report, convinced beforehand that my efforts would almost certainly be rewarded with an 'A'. Sounds trivial but the experience made me question my ability to think critically and write at a time when my studies meant everything to me and I, like many other teens, was desperate to discover what I was good at. But after a period of mourning – for the hotshot I thought I was – I simply accepted the feedback and vowed to be better. The following year I collected that 'A'. I think that's the key – learning what not to do. There are no shortage of blustery blog pieces out there from entrepreneurs about the importance of trying new things, failing big, dusting yourself off and then going again. But there is no formula as such. All any of us can do is be bold without being stupid. In other words, committing to a life of conscious acceptance of new challenges. And a willingness to feel vulnerable. In society we love to fetishise talent, giving awards for excellence and worshipping the best for their possession of something rare, divine and wholly natural. The reality is that the Federers, Picassos, Princes, Streeps and Messis of this world each had to graft and raise their bar time and again before they were acknowledged as greats. It may have taken more or less than the famous 10,000 hours mooted in Gladwell's Outliers, genes may indeed have been the decisive factor, but one thing is certain: the more you practice, the better your chances are of being good at something. At that's what each failure is essentially – practice. Sir James Dyson didn't become the vacuum king overnight. He screwed up. Over and over again – 5,126 prototypes over 15 years to be precise – before hitting upon a winning formula. Then there's Victoria Beckham, so often the subject of ridicule as the pouting pop star more famous for being a WAG than a talent. Her response? She simply rolled her sleeves up, pursued a passion and transformed herself into an internationally respected fashion designer. That takes a hell of a lot more than talent. So what are you scared of? Time for an attitude readjustment in society, and that extends all the way from the classroom to the boardroom. I like the idea of a Museum of Epic Failure or an Institute of Brilliant Failures. How about each company publishing an annual failure report? In the meantime, we have the wise words of many inspiring and successful individuals to guide us. Here are my top 12 quotes about failure – some are pithy and poignant observations, others are stories to which we can all relate. 9. "You don't learn to walk by following rules, you learn by doing and by falling over." 10. Michael Jordan, the greatest basketball player of all time. It's live… Listen to the latest Ideastap podcast below, featuring horror stories from comedian Josie Long, Wolf Music records' Matt Neale, Documentally's Christian Payne and actress Anna Dawson.